U.S. Navy Rear. 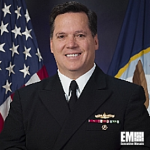 Adm. Tom Druggan, commander of the Naval Surface Warfare Center, has been appointed director of the Aegis Ballistic Missile Defense System program at the Missile Defense Agency, the Defense Department said Monday. Druggan has supervised more than 17,000 engineers, scientists, technicians and support personnel across eight NSWC divisions in his more recent capacity. He also performed duties of the DoD executive manager for military explosive ordnance disposal technology and training. Previously, Druggan was a commanding officer and commissioning combat systems officer of the USS O’Kane Aegis ballistic missile defense destroyer, executive officer of USS Lassen, combat systems officer of USS Elliot and anti-submarine warfare officer of the USS Callaghan. He also served as a program manager for Aegis combat systems in the Program Executive Office for Integrated Warfare Systems, program manager for In-Service Aegis Fleet Readiness, special assistant to the chief of naval operations, special assistant to the vice chief of naval operations and founding member of the Navy Operations Group Deep Blue.